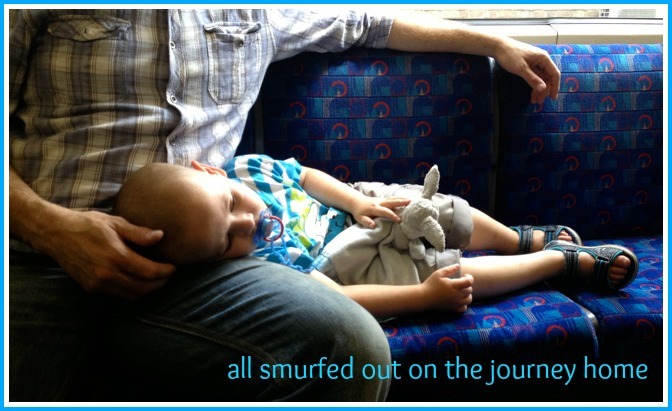 Last Weekend after our Birthday Celebrations we have been invited to attend a Screening Premier of the new Smurfs 2 Movie in the Covent Garden Odeon. We decided to catch the Train and Tube into town and that alone was a Adventure for Finn. Alongside loads of other Bloggers and some great dressed up Smurfs, Finnster Mr. C. and me enjoyed a warm welcome from a Smurftastic Team of Ladies and Gents who made sure we where all smurfed up and ready to watch the big Movie. The live action/animated family blockbuster comedy The Smurfs 2, the evil wizard Gargamel creates a couple of mischievous Smurf-like creatures called the Naughties that he hopes will let him harness the all-powerful, magical Smurf-essence. But when he discovers that only a real Smurf can give him what he wants – and only a secret spell that Smurfette knows can turn the Naugthies into real Smurfs – Gargamel kidnaps Smurfette and brings her to Paris, where he has been winning the adoration of millions as the world´s greatest socerer. It´s up to Papa, Clumsy, Grouchy and Vanity to return to our world, reunited with their hum friends Patrick and Grace Winslow, and rescue her! Will Smurfette, who has always felt different from the other Smurfs, find a new connection with the Naughties Vexy and Hackus – or will the Smurfs convince her that heir love for her is True Blue? 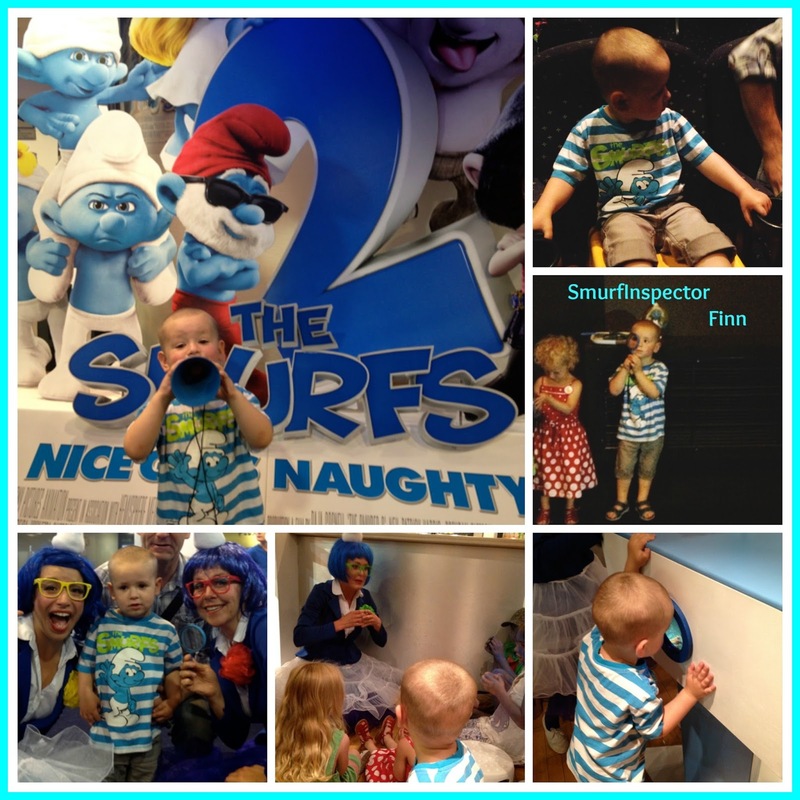 After the Movie is was onto a hunt for all sorts smurftastic to discover and Finn certainly enjoyed all the activities who where on offer. We also had a chance to check out the new Smurf Toy Range from JAKKS Toys which i thought was great for any little Smurf Fan out there. 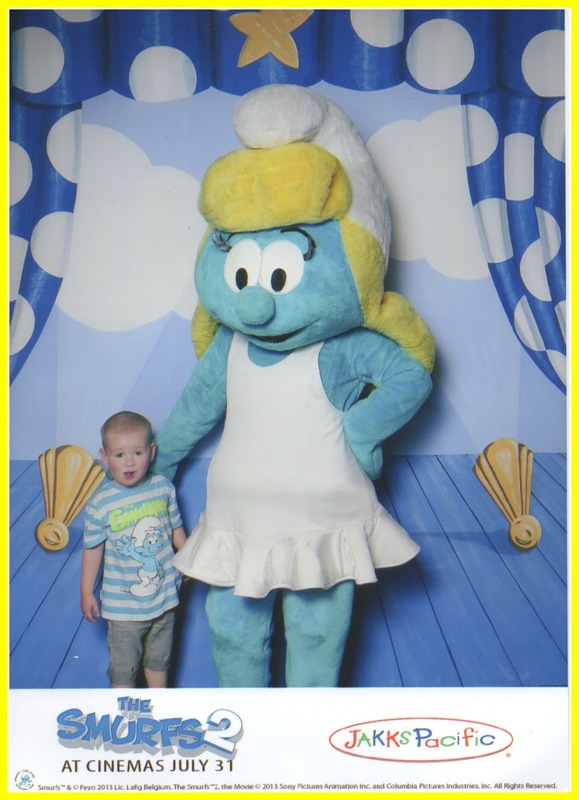 Before heading home with a lovely little Smurfbag full off Goodies Finn was able to have his picture taken with Smurfette don’t they make a lovely Couple? Aww, looks like he had a fab time! Gutted to have missed it but looks like it went so well.